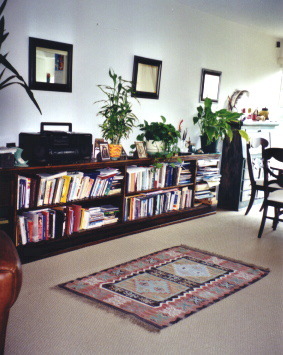 "Since you introduced me to Feng Shui 4 months ago I immediately started clearing the clutter and re-arranging objects and furniture in my tiny 2 bedroom apartment. I set my intention to shift the energy in my life in a big way. Well, it happened. I received a huge promotion in my job, re-united with my boyfriend, got to travel with my 2 children and we're now moving into a beautiful 3 bedroom house with a pool!" Just want to thank you again for taking so much time with me. Learning about Feng Shui and incorporating it into my life was wonderful and fascinating. After our meeting, I did a few quick changes before the showing. Both people that came to see the house were interested, and made appts to come back today!! The biggest news is that one of the people that came today has already made an offer!! WOW! So now we're playing the negotiating game, and I'll still have an open house tomorrow, but it seems like feng shui and moving my energy is really working! Thanks again for everything!" "Your workshop was outstanding and much better and more exciting and informative than I expected." Explanation: Notice how before, the entranceway felt very disjointed and disconnected. Imagine coming home every day and having your balance be "off" before you even set foot in the house. 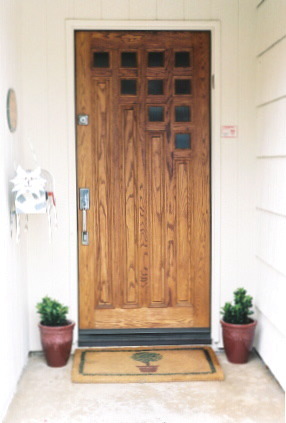 In Feng Shui it is good for balance and protection to have something equal on either side of the door, and it's amazing what nice energy something as simple as a new welcome mat can make. 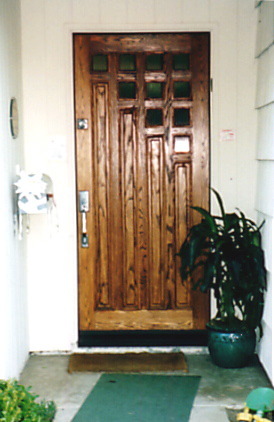 Take a look at your own front door entrance and see what it is saying to you. "I just wanted to personally say thank you yet again for everything that you did, you're doing and have done for us through your work. Since your consultation things have moved for me in ways that I always had imagined that they would. Yesterday I met with the William Morris agency to dicsuss them representing me as a music consultiant and as a performer. I am truly at the height of my powers. I really think that a lot of it has to do with me, a lot of it has to do with the energy, and a lot of it has to do with the suggestions that you made on how to shift that energy and I thank you and may G-d Bless you for everything that you do." 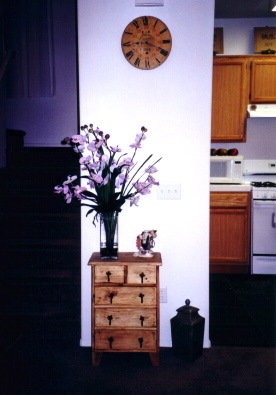 "Since our consultation, we implemented several minor adjustments to the placement of items and elements in all areas of our home and yard. In 3 months time we have noticed an increase in harmony and balance within our relationships and significant financial increases in the flow of our businesses." I've been meaning to write and thank you so much for your warm personality and your amazing help! I took your guidance on redoing my cubicle at work and I've been so much happier there already--that & I oddly wound up getting assigned 2 stories that I never in a million years thought they'd assign to me for way more $ than I usually get. : ) 'It's working!' I'm still working on some of the adjustments in my home, but am just beyond ecstatic with your input and wanted to make sure I relayed that to you!!!! Thanks again so so much. I wish you the best!" 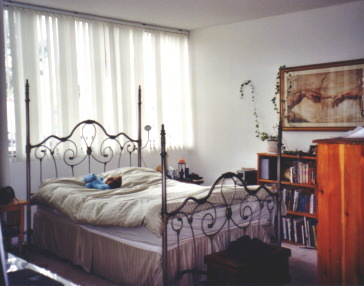 Explanation: Notice the bed under the window, in Feng Shui proper bed placement is very important to the support and harmony of your well-being. Placing the bed under a window is not ideal, having a solid wall behind you in a proper position in the room will give you much more support. Feel the difference between something transparent above your head and a solid wall which is so much stronger. 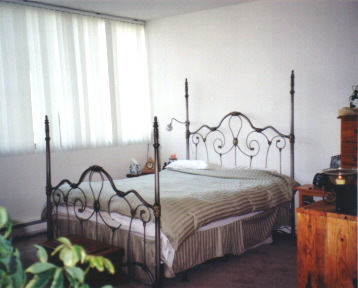 Of course in Feng Shui a solid wood headboard is best, this is just a good example of placement issues. You recently did a Feng Shui consultation for three other teachers at my school. My friend and I are now on our second year of teaching since having our consultation with you last summer. Last year we felt that the classroom environment was very positive. The children were more quiet and focused than usual. We even had a few students who had been on behavior contracts the year before, and then with us it wasn't even necessary. I just believe that the environment supports better behavior and better learning! The kids seem less distracted and more quiet and focused! Now for a teacher that is so great! My classroom has also become a more peaceful place for me to work. I feel very much at home in my classroom and very comfortable. When things settle down at school I would like you to do a home consultation for me. Thanks for helping make a positive difference in many people's lives." "Your workshop was much easier to follow than other workshops. I got a much better grasp for Feng Shui." "The consultation process was very enlightening and inspiring. I thought I would have to make so many changes and buy so much, but right away I started making adjustments with the things I had and my apartment truly feels like a home." "The workshop really built up the little knowledge I had to a confidence to make important changes." Explanation: Sometimes a big empty void within the environment can create an imbalanced flow of energy. 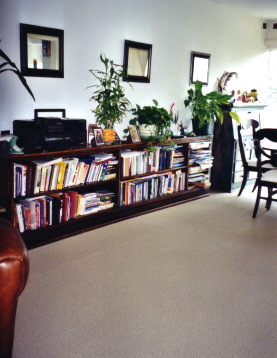 Simple enhancements like this area rug can help create a nice, gentle meandering flow of energy. "I love receiving your monthly tips! They are so insightful and inspiring, and totally down-to-earth. It makes me motivated to do a little bit each month. Thanks!" "My life completely started turning around within days and weeks of making the changes you suggested. I sleep much better and my career is taking off. After cleaning thoroughly, adding some silk flowers, hanging a crystal and rearranging my bathroom, which happened to be in my wealth area, I was promoted at work and given a huge raise. Suddenly everything in my life is interconnected and one area helps another." "After working with Heather, I have found her insights, perceptions, and keen intuitions to have a definite impact on life changing events for her clients. She is the driving force to achieve balance and harmony in each of their lives." 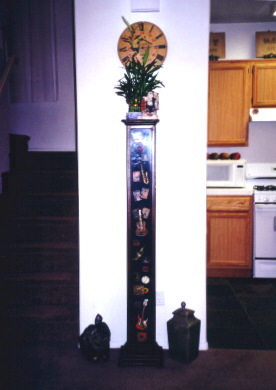 Explanation: This is the foyer area of a nice condo, but notice how in the before picture the straight, tall, dark (albeit beautiful) CD case creates a split and harsh energy coming at you as you enter the front door, plus the clock is covered up by the plant creating a bit of clutter. Creating something as you enter your home that is softer helps the energy flow better which will make you feel more peaceful upon entering your home. I want to thank you for bringing such a great understanding of Feng Shui into my awareness! Over the past year of changes to the house (and my life! ), I have really come to appreciate this art and truly never cease to be amazed by how simply it all works. Here is my latest story that I would like to share with you. With starting up my new business and working out of my home, I have been meeting my needs financially, but not without effort and enormous amounts of faith that money is in flow. Yesterday, I took a break from working at my desk and was drawn outside to the back yard of the house. I grabbed some clippers and trimmed some tree branches that were very, very full hanging low over the garden area, which happened to be overgrown with some grass and weeds. I was really drawn to this area the last few days and so today, I took another break started pulling up the grass and weeds from this same area. While out there with the warm sun shining on my back, I thought about the fact that this area is the wealth area of my lot according to the bagua and that helped motivate me to keep going with the clearing and cleaning. I was still elbows deep in dirt and already one large rubber trash container full of weeds and such when my telephone rang. It was a woman asking if she could stop by to do some shopping. I asked when she wanted to stop by and her reply was "I am on my way now." So I came in and washed up. Well, she proceeded to buy $487 worth of merchandise. I just love this stuff!!! Please feel welcome to share this story or put it on your website. Being aware of the energy in your home or office is so incredibly helpful to everything in our lives! WOW! What a day! Thank you so much, Heather, for all that you have done with your consultations here at my home and office. They have been so thorough and understandable that I have really been able to continue to implement the concepts on an on-going basis. Best wishes from one of your "sold-on-this-stuff" clients!"